There are so many things to see and do in Washington D.C., but we all agreed that visiting the National Zoo was a must. We weren’t sure what to expect, but I can safely say that we were all pleasantly surprised. Rob and I had no idea just how big it was, and the variety of animals was incredible. We went to see the pandas first, hoping to catch a glimpse of baby Bao Bao. 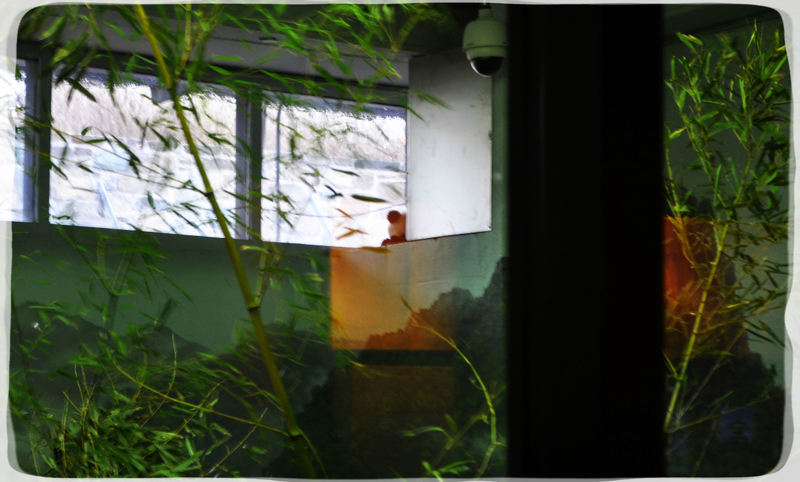 She was sleeping in the window while her mama, Mei Xiang, munched on bamboo. She was hard to see, and with the reflection of the glass was even harder to get pictures of, but she moved just often enough to make her presence known. We had such a wonderful day laughing at the tigers as they hissed at ducks in their pond, listening to the lion roar at anyone who would listen, watching the orangutans cross from exhibit to exhibit using their O-line, admiring a handsome male peacock strut his stuff in front of an attractive female (who didn’t seem care one way or another) and being absolutely amazed at just how much noise a stand of flamingos can make. The animals all had such beautiful habitats and it was very apparent that a lot of time and effort went into making sure they were happy. For the second day in a row, we had absolutely beautiful weather. The crowds were minimal again, making for an enjoyable day wandering around the park. We spent the entire day there, leaving only as the zoo was closing for the night. As we were walking back to the parking garage, the kids kept asking us what our favorite animal was, but it was really hard to pick just one. They were all so amazing in their own ways. Posted in Crazy Kids, Daily Life, Family Adventures, RV Life, Travel, Washington D.C.	| Tagged animals, Bao Bao, National Zoo, RV life, the National Zoo, travel, Washington D.C.